Hmm, this is where I have to admit all of my guilty TV viewing pleasures, isn’t it? I don’t watch a huge amount of television, and what I do watch tends to be via Netflix or catch up TV. I’m not a fan of daytime TV, which tends to be the only time I actually get to watch any. This is usually with Little M asleep on me, while I simultaneously blog/tweet/facebook/instagram, so few programmes get my full attention. I do have a few staples at the moment though. So, here are my current favourite TV programmes. Firstly, Neighbours. Yes, I did say that this would be a post of guilty pleasures! I’ve watched it for years, pretty much since I was a toddler I think. I remember buying Neighbours cards in packets that came with a stick of chewing gum on the way home, which I then diligently stored in a red plastic Snoopy lunch box (the cards, not the chewing gum). Proper 80s. I can’t tell you how excited I am about the new series of The Apprentice, although I must admit I was a bit underwhelmed by the first episode this series. This programme tends to get better as the series goes on though, and my favourite point is the interview episode, specifically Claude and the grilling he gives the candidates. I’m gutted that it’s the last in the series of this. I’ve enjoyed it just as much as The Tudors and it’s gone a little way to filling the gaping hole that Downton Abbey has left in my life – I do like a bit of historical drama. Find it on ITV catch up if you haven’t seen it yet! What’s your favourite TV programme at the moment? 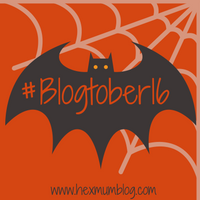 "#Blogtober16 Day 9: The movies I never get sick of watching"
"#Blogtober Day 7: Why I started blogging"
Thank you! I was expecting most people to consider my taste rather questionable! Ooh at what point did you stop? I’m starting to think they’re dragging it out unnecessarily and I’m only on series 3 of 7! Great choices! I love Neighbours. I watch it every day! Such a guilty pleasure!